This industry can scale new heights through fresh investments, as per stone articles are very popular among the tourists. 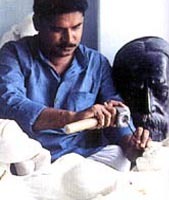 Stone carving is an ancient tradition and several high quality stones are indigenous to the state. Particularly Jaipur, Jaisalmer, Molela (rajasthan), Marking (Nagaur), Saikandra (Dausa), Bansi Paharpur (Bharatpur), Dholpur, Kishangarh, Barmer and Udaipur. These make attractive buys & souvenirs, Since the craftsmanship is associated with the state. Abundant opportunity exists for development of this industry as replicas of tourist monuments such as Hawa Mahal, Victory Tower etc . Rajasthan is known for its rich handicrafts industry and the bazzaars are full of the most colourful and exquisitely finished products. However, these are often traditional crafts and there is no contemporary souvenir industry. All tourist and handicraft centres have their own areas of specialty and expertise. Instant opportunity in the tourist markets, especially for replicas of well known monuments such as the Hawa Mahal and abstract or artistic renditions of popular handicrafts in any of variety of textures and mediums. Investment can be made in this segment to develop it as a tourist product. Before mechanization, people in the state traveled by horse carriages and chariots. In some pockets, horse-drawn tongas are still popular. All tourist centres, but more particularly the popular centres such as Jaipur, Jodhpur, Udaipur and Bikaner. A fillip can be provided to local forms of transportation, as a means of both entertainment and transportation. In addition, vintage cars can also be used for special occasions.